Solanum nigrum L. is a hyperaccumulator and shows very high phytoremediation potential for Cd-contaminated soil. Fertilizer addition to soil is an effective pathway to improve Cd hyperaccumulation. This article compared the strengthening roles of commonly used four nitrogen fertilizers with three organic fertilizers on S. nigrum hyperaccumulating Cd at the same total nitrogen level. The results showed that Cd concentrations in roots and shoots of S. nigrum were not affected by the addition of inorganic nitrogen like NH4HCO3, NH4Cl, (NH4)2SO4, and CH4N2O compared with the control without nitrogen addition. However, Cd concentrations in S. nigrum roots and shoots were significantly decreased (p < 0.05) when the organic nitrogen was added in the form of chicken manure, pig manure, and commercial organic fertilizer (by 15.6% and 15.1%, 30.1% and 23.6%, 20.3% and 16.8%, respectively). On the other hand, of all nitrogen treatments, the addition of (NH4)2SO4 and CH4N2O to the soil enormously increased S. nigrum biomass, i.e., S. nigrum shoot biomass increased 2.0- and 2.1-fold compared with the control. Correspondingly, Cd loads in S. nigrum shoots were also the highest in former two treatments and amounted to 79.91 μg pot−1 and 80.17 μg pot−1, respectively. Compared with the control, the addition of three organic fertilizers significantly increased (p < 0.05) pH and decreased (p < 0.05) available Cd concentrations in the soil, which could be the main reasons for their negative effects on S. nigrum accumulating Cd. (NH4)2SO4 and CH4N2O significantly increased S. nigrum biomasses and exerted no effects on the available soil Cd concentration, which made them more better fertilizers in practice. In general, the same fertilizer may show different effects on different hyperaccumulators. The selection of fertilizer should be decided in accordance with the specific conditions in the phytoremediation practice of contaminated soil. Cadmium Contaminated soil Phytoremediation Fertilizer Solanum nigrum L.
All authors are grateful for the revision made by Dr. Lidia Skuza from the Department of Molecular Biology and Cytology, Institute for Research on Biodiversity, University of Szczecin, Szczecin 71-415, Poland. 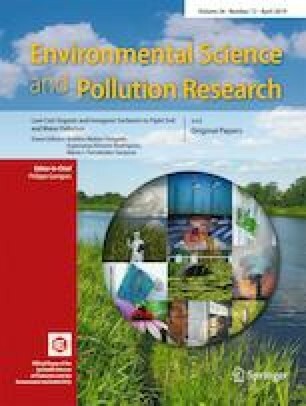 This work was supported by the National Natural Science Foundation of China (41571300, 31870488, 31270540 and 31070455), the Special Plan in the Major Research & Development of the 13rd Five-Year Plan of China (2018YFC1800501, 2016YFD0800802), Key scientific research project of Shaanxi Provincial Education Department (17JS023, 2018SZS-27-07) and the project of Foreign Experts Bureau of Shaanxi province (GDT20186100430B).